George Louis Wolverton, 80, of Pascagoula, MS, passed away on Saturday, February 2, 2019 in Pascagoula. George was born on April 7, 1938 to the late Walter and Clyde Wolverton. George worked many years for Ingalls Shipbuilding until his retirement in 1997. He later spent a few years at V.T. 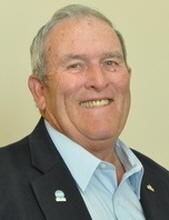 Halter Marine until being elected to the Pascagoula City Council, where he served two terms. After taking a term off, he decided he would run for his seat again and was honored to again serve the city as a councilman. George and his wife Virginia were members of Ingalls Avenue Baptist Church. He will be remembered for his sense of humor, his knowledge of city government regulation, and for the love he had for his city and family. In addition to his parents, George was preceded in death by his brother, Howard Wolverton. He is survived by his loving wife of 53 years, Virginia Johnson Wolverton; children, George Wolverton Jr. and Kaitlyn Wolverton (Brandon) Radcliffe; great-grandson, Bryson Green; siblings, Walter S. (Lynda) Wolverton, Jean Wolverton Evans, and Martha Wolverton Applewhite; special friends, Beth Robinson, Bill Jones, and Jonny Borden; along with numerous nieces, nephews, other family, and friends. The family would like to thank the doctors and nursing staff of Singing River Hospital, too many to mention by name, for the exceptional care they provided to George. The visitation for George will be held on Wednesday, February 6, 2019 from 10:30 a.m. until 12:00 p.m. at Ingalls Avenue Baptist Church in Pascagoula, MS. The funeral service will follow at the church beginning at 12 noon with Bro. John Turner officiating. Interment will be held at Serene Memorial Gardens in Moss Point. In lieu of flowers, George’s family has requested donations be made to St. Jude Children’s Hospital, 262 Danny Thomas Place, Memphis, TN 38105. To send flowers or a remembrance gift to the family of George Louis Wolverton, please visit our Tribute Store. "Email Address" would like to share the life celebration of George Louis Wolverton. Click on the "link" to go to share a favorite memory or leave a condolence message for the family.